Well, this is a fascinating one... Vip Air was founded in 1991, as a subsidiary to Sultan Air, another Turkish operator with a few Boeing 737s to its name. Sultan Air was founded in 1989 as a joint Swedish (Transwede Airlines) and Turkish (various business interests) operation. But times were hard with the effects of the Gulf War and Turkish domestic unrest clearly showing in dwindling numbers of holidaymakers travelling to Turkey. 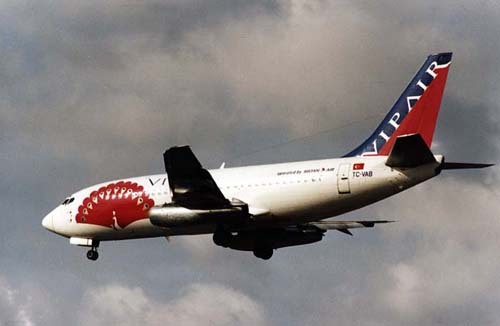 Sultan Air was discontinued on financial grounds and a subsidiary called Vip Air was started to operate domestic scheduled services; but this lasted only briefly (it did not make money) and Vip Air was again integrated in Sultan Air in 1992, which had made a new start with 737s and 2 Airbus A300B4s. Due to safety shortcomings on aircraft, the Turkish authorities withdrew Sultan Air's AOC (Aircraft Operating Licence) and in November 1993 all operations ceased. Boeing 737-248 TC-VAB (cn20221/227) is seen here on final approach into Amsterdam Int'l in april 1992; during 2000 this aircraft was in use by TANS � Transportes A�reos Nacionales de la Selva of Peru (OB-1719).